I had a lovely Mother's Day, I was even treated to breakfast in bed!! Isabelle made me some lovely cards (3 altogether!!) 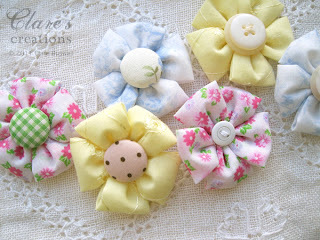 Niall spent some time with Isabelle in the garden and let me do some crafting! It's not often I get the luxury of time!! 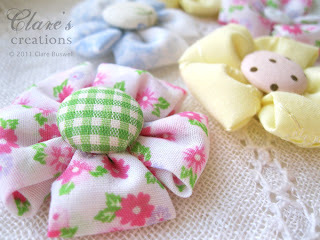 SO, I still couldn't find the website I saw the tutorial for these flowers on so I put together my own tutorial for you. They are just the cutest little flowers and quite quick to make if you leave out the ironing bit... like me (except for the tutorial)!! 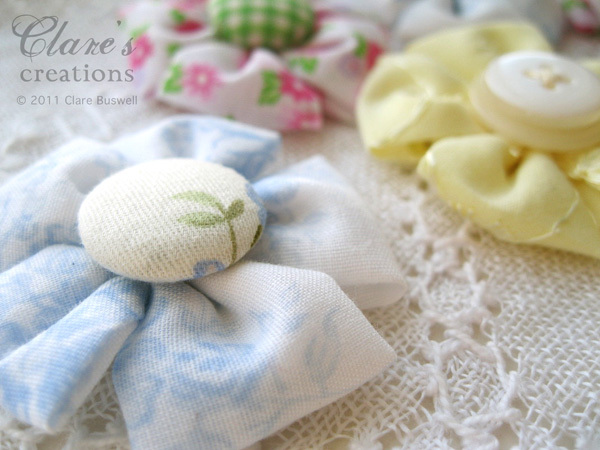 They use so little fabric and they're great for using up any scraps you have hanging around. The size I made them is just perfect for cards, not too big, less than 2" when finished. 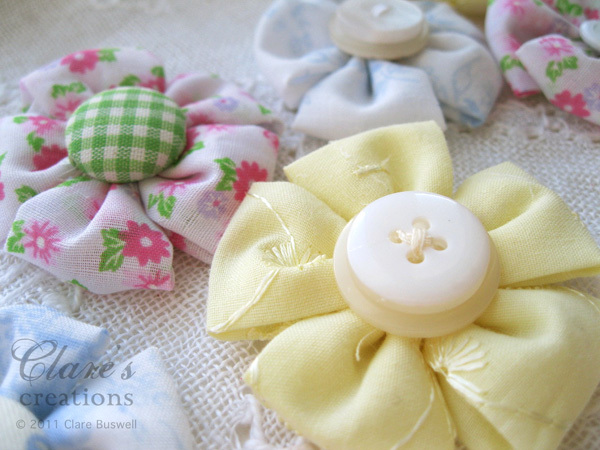 I played around with different centers, fabric covered buttons look great with them but you could try different variations, I also layered various sized buttons. 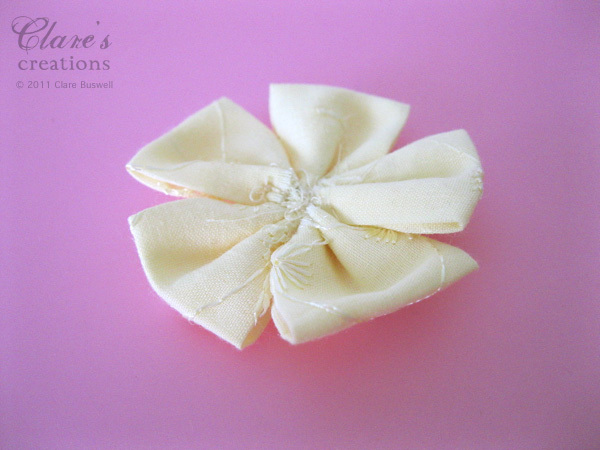 For the tutorial I ironed the folds so you could see clearly how it's made but I find it quicker not to iron them and you get a softer looking flower. Anyway, on with the tutorial!! All you need is five squares of 2" fabric, cotton works well but you could experiment with different fabrics once you get the hang of them. 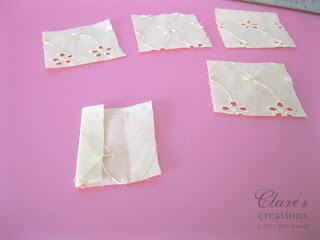 Here I used an eyelet lace fabric or broderie anglaise. 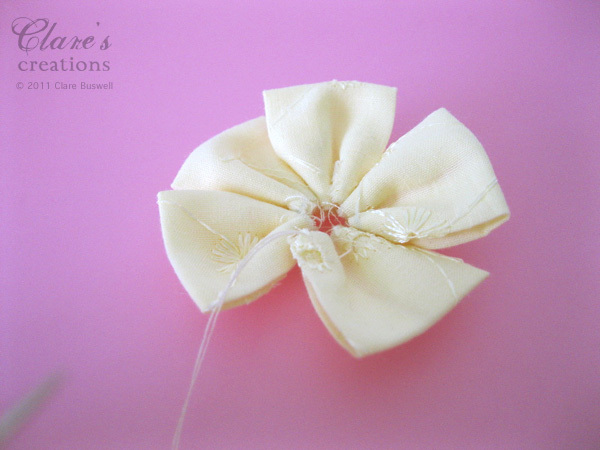 For each petal, fold one side of the square in to the centre so it's in the middle. 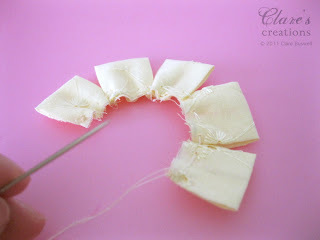 Fold the other side in to the centre so the edges meet. You could iron the folds at this point. Now, fold it in half and iron the crease. Repeat this for each of the petals. Take a needle and thread, I used it on the double and tied a knot at the end. 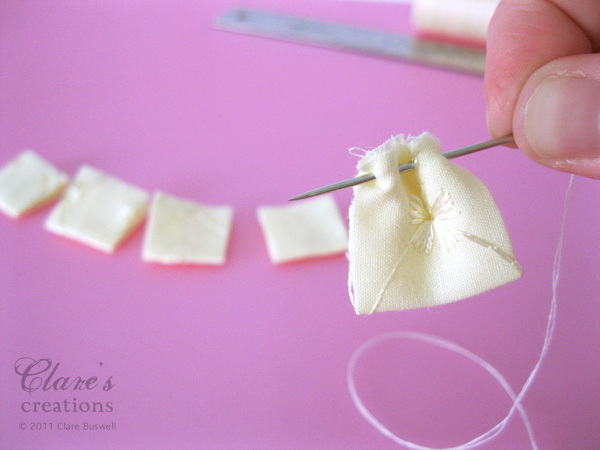 On the open end of each petal, simply put your needle in and out as shown above. Repeat with all the five petals. Pull your thread tight to gather the petals, stitch to join to the first petal at the centre. I added a few stitches to secure the centre front and back. That's basically it. You can fluff up the petals to give a softer look. If you don't iron any of the folds (like me!!) 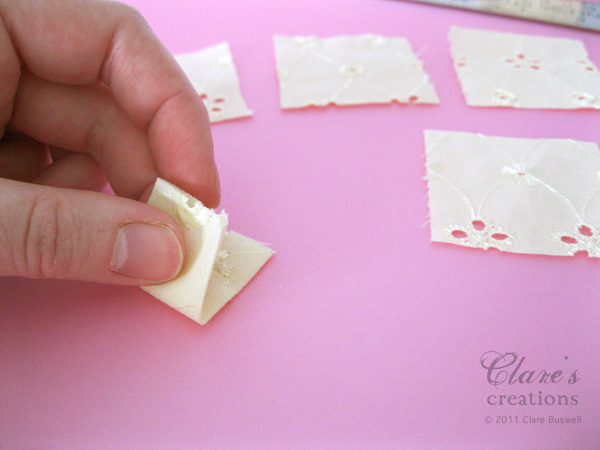 I found the easiest way to keep the petals held together before you stitch them is pin them to a sheet of foam. If you don't iron them they won't hold the fold very easy, so pinning them down straight after you fold them makes it much easier to stitch all the petals together. 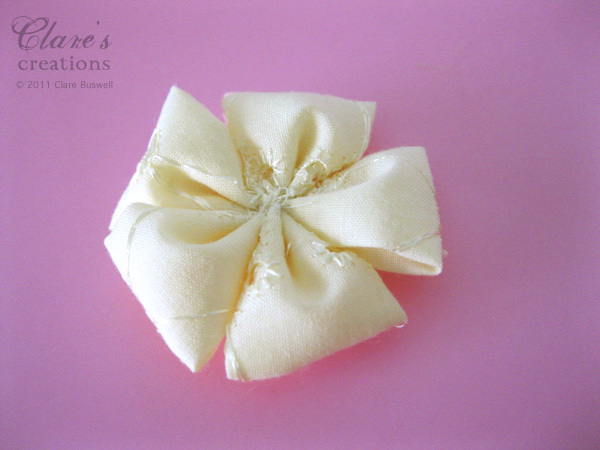 This also gives a much softer looking and puffier flower! Which I prefer but it's up to you!! These are wonderful! Happy Mother's Day! So stinkin' CUTE! 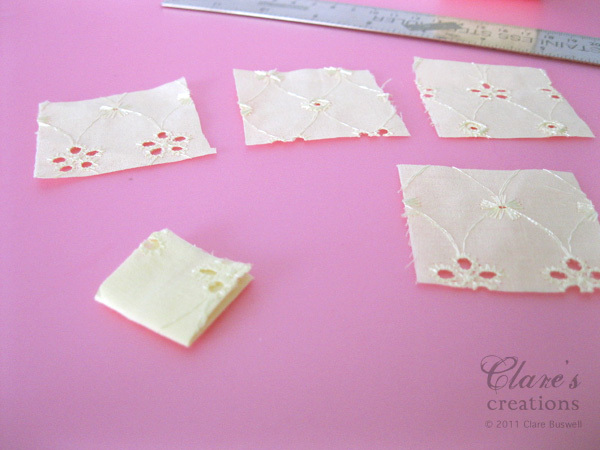 I might give them a try and instead of folding the two sides into the center, I might just sew a tube on my sewing machine and then turn right side out and snip at 2" intervals. Gotta go make some!!! You're such an enabler!!!!!!!!!!!! 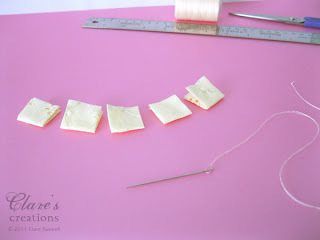 FAB tutorial!!! THANKS!! They are sooo pretty, LOVE all the different centers!!! Ohhh these are gorgeous, and my type of flower - requires no sewing! 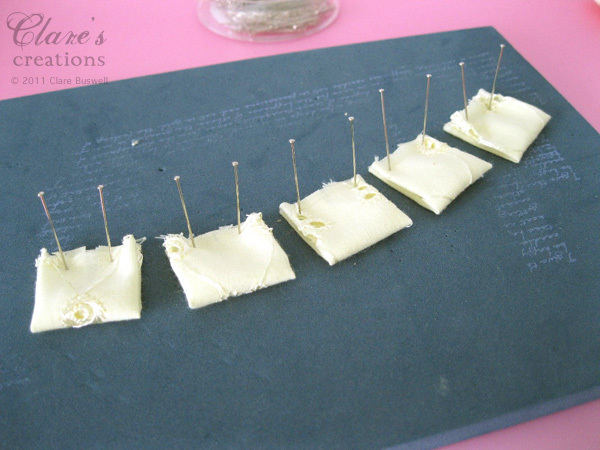 ( I can't sew lol), thanks for sharing that with us. Happy mothers day to you, hope you had a relaxing day. fabulous tutorial, thank you, will try them out right away! These flowers are so scrummy. 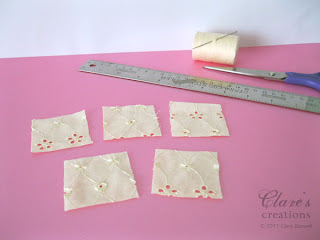 Thank you sooo very much for this tutorial - we all have no excuse now.... actually can't wait to give these a go and when I do I will let you know. Fabulous tutorial! Thanks so much! Can't wait to give it a try. Happy Mother's Day (a little late)! Wonderful! 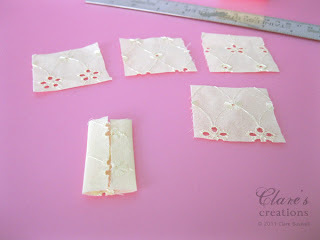 This is very clear and easy to follow - I can't wait to try these sweet little embellishments! Thanks a lot for this detailed tutorial! Your flowers are sooo sweet!!! I´d like to grab them straight from your pics! I love the puffy flowers! Thanks for the tutorial!!! thanks for the tutorial; your flowers are gorgeous! These are WAY SWEET! Thanks for sharing the tutorial! I've got it bookmarked!